Lartington is a village and civil parish about 2 miles (3 km) west of the town of Barnard Castle, in Teesdale, in the Pennines of England. The 2011 Census recorded the parish's population as 135. 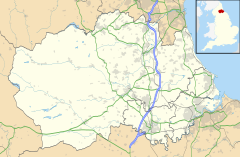 Lartington is historically in the North Riding of Yorkshire but along with the rest of the former Startforth Rural District it was transferred to County Durham for administrative and ceremonial purposes on 1 April 1974 under the Local Government Act 1972. The parish is notable for Lartington Hall, the seat of a Roman Catholic family who were recusants. Lartington railway station was on the South Durham and Lancashire Union Railway, which is now abandoned. It opened in 1861 and closed in 1962. ^ Barnard Castle & Richmond (Teesdale) (Map). Landranger. Ordnance Survey. 2011. § sheet 92. ISBN 9780319228982. ^ "Area: Lartington (Parish): Key Figures for 2011 Census: Key Statistics". Neighbourhood Statistics. Office for National Statistics. Retrieved 7 July 2015. This County Durham location article is a stub. You can help Wikipedia by expanding it. This page was last edited on 23 September 2018, at 18:36 (UTC).